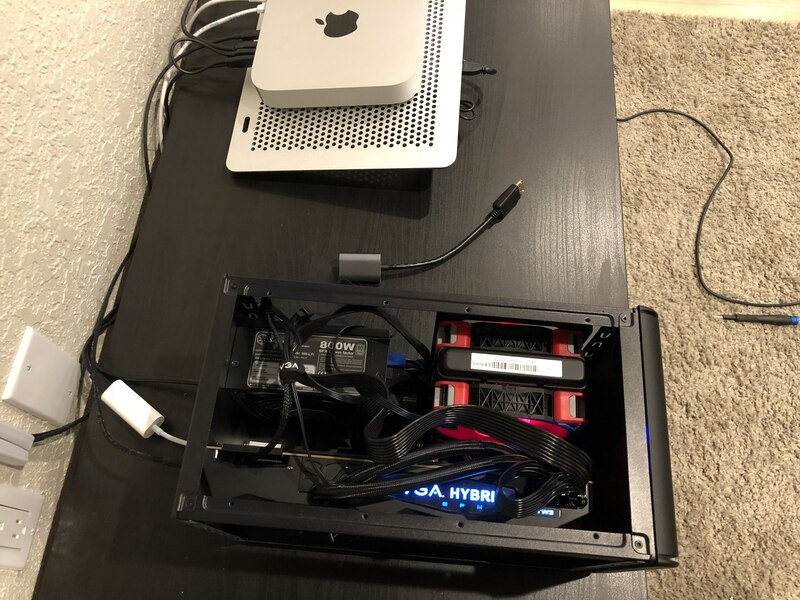 When Apple announced eGPU support in High Sierra I bought a Developer Edition Breakway Box. I replaced the RX 580 that with it with an R9 Fury X. I also replaced the stock PSU with a Silverstone SFX-L 800W 80 Plus Titanium unit. Overkill but why not. A better view of the internals. I replaced the stock fan on the Fury X with two Corsair ML Pro 120 Blue fans. I also changed the tachometer LEDs to Blue. 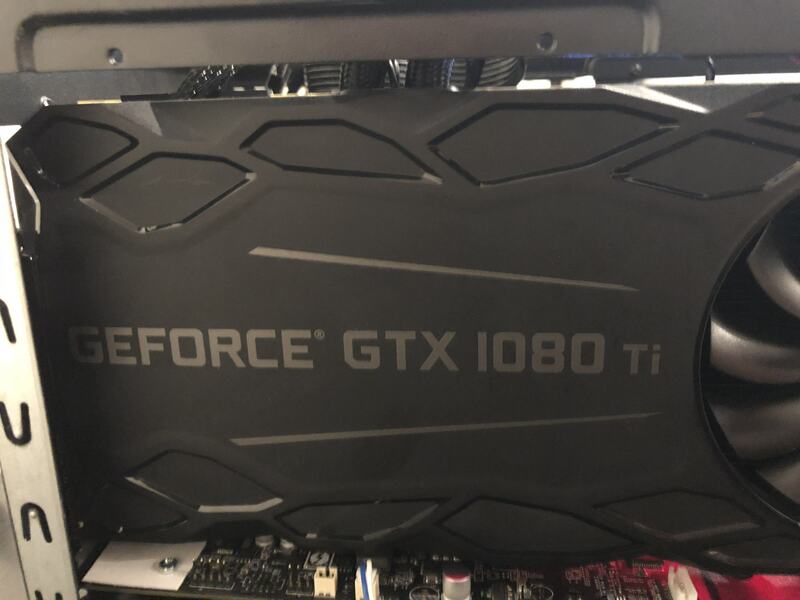 The Fury X stopped working after a Windows update, and after trying a bunch of fixes I decided to swap it out for a GTX 1080. This pic gives an idea of the how it fits. You have to slide the GPU in at an angle but once inside you can straighten it out and it fits fine. 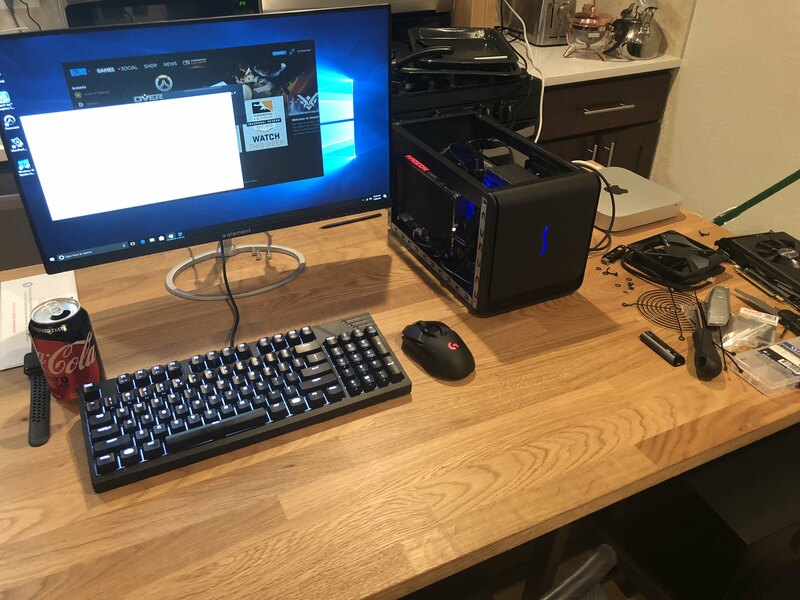 Here it is with the top on and the Fury X just chillin there. 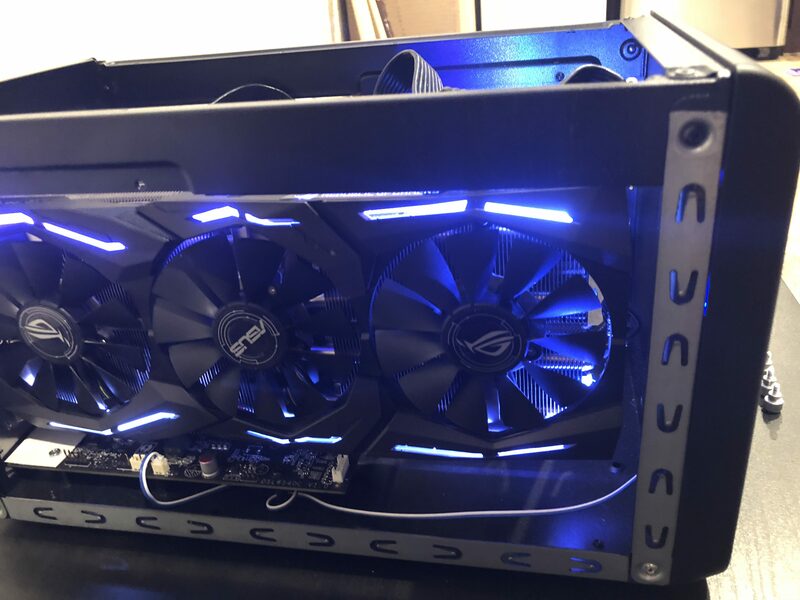 Close up of the Asus ROG Strix GTX 1080. This was the quietest GPU I tried with Windows. 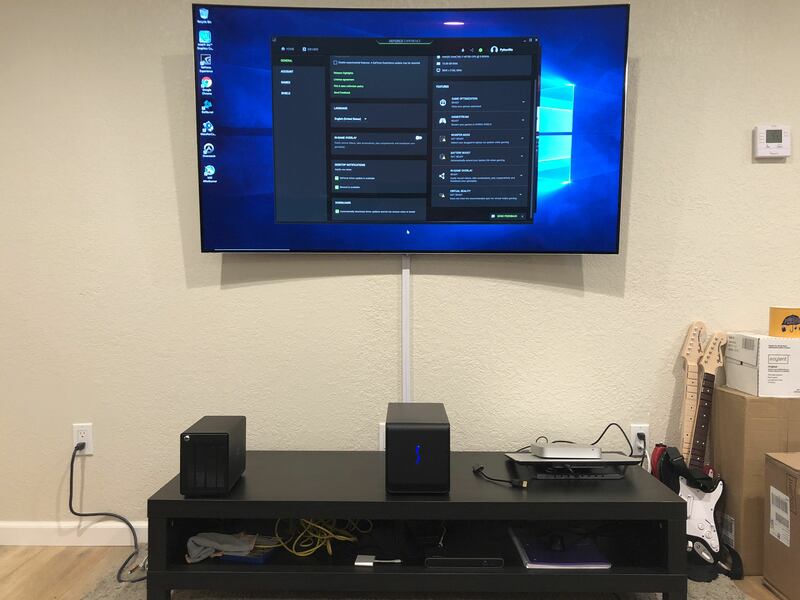 Here is a pic showing my setup with my 4k LG OLED TV. The black box on the left is a Thunderbay 4 that I was planning on using for games. Sadly I couldn't get the 4th HDD to work with windows. Plus display into the HDMI port at the back of the Mac mini. 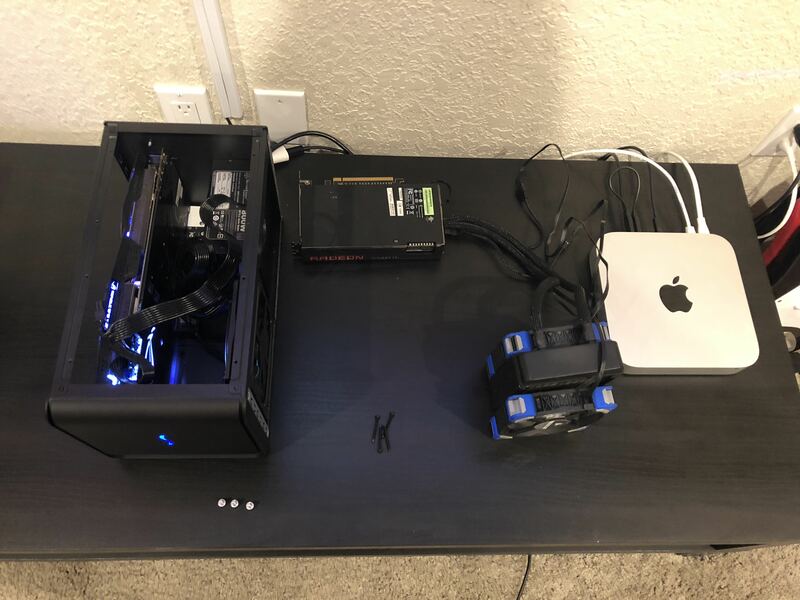 Do not have the eGPU plugged into the Mac mini at this point. Install Windows 10 in Bootcamp. 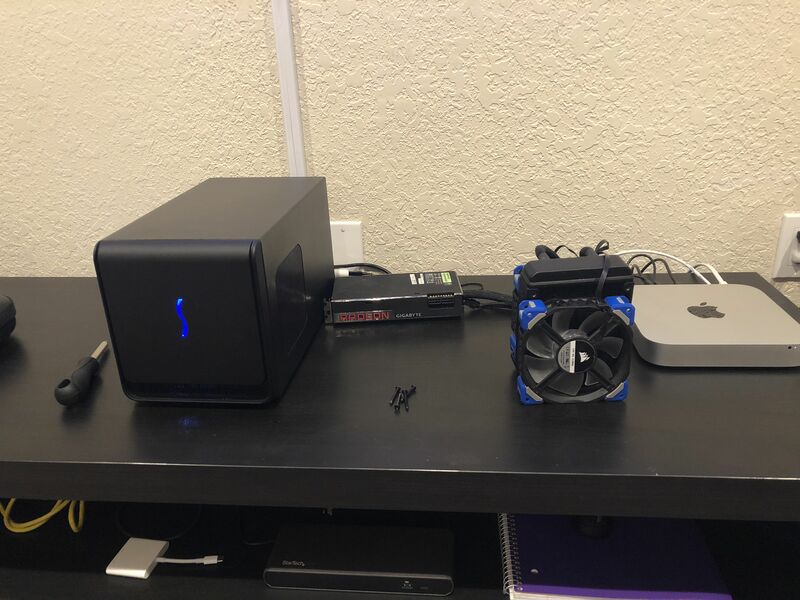 Plug the eGPU into the Mac mini, do not plug tv into eGPU yet. 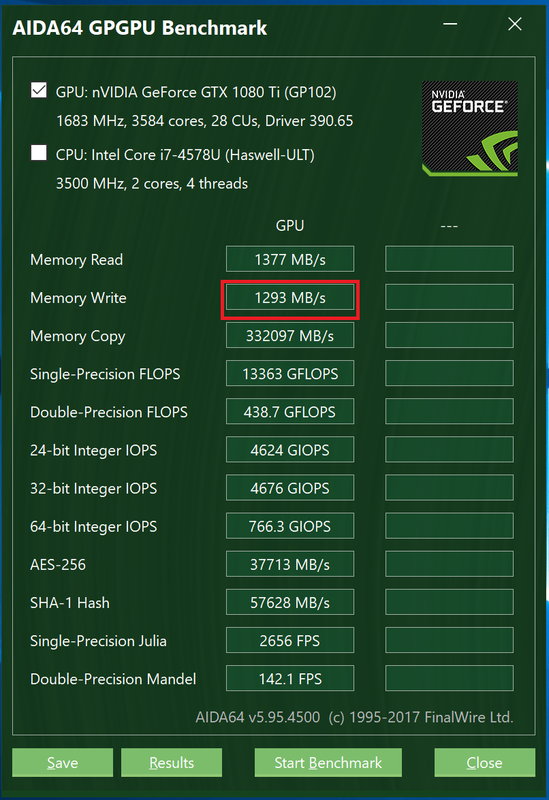 For AMD I couldn't get my R9 Fury X running reliably, I suggest you stick with NVIDIA for ease of use. I mostly play Overwatch on this. I tried playing Overwatch through Parallels and it was really really bad. That motivated me to try an eGPU on Windows, and I can now play Overwatch on Epic settings at 4k and hit 60fps most of the time. 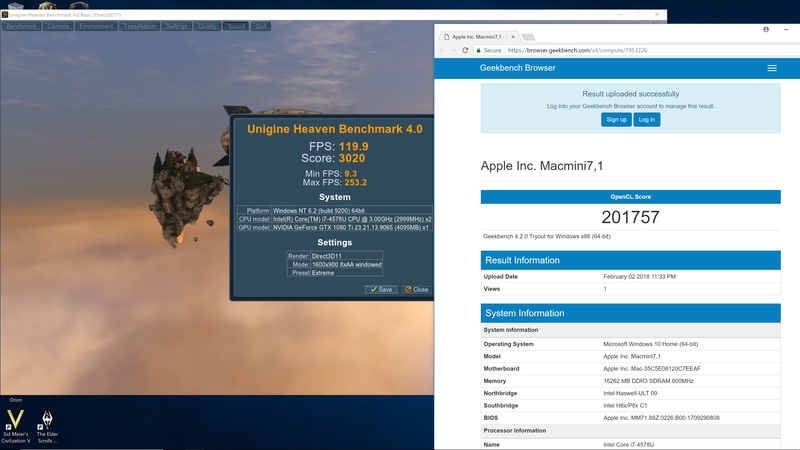 Also, I can use a 4k monitor on my Mac mini at 60Hz now, which you can't do natively. I also use this for Netflix and Crunchyroll, and it is pretty quiet. I want to know the setup. 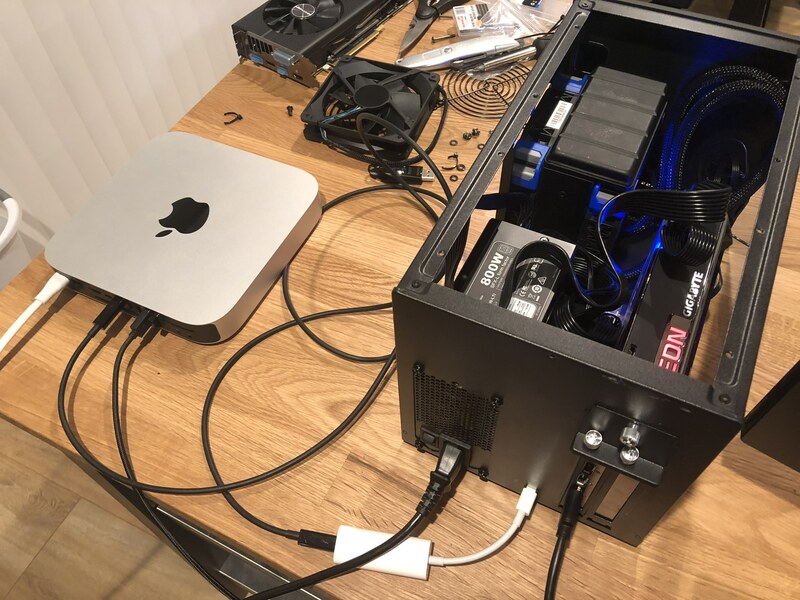 MacMini --> TB2 male wire --> TB2 to Tb3 apple adapter --> TB3 male wire to Sonnet eGPU and the system works in High Sierra and Mojave? I want to use a RX580 to get HDMI [email protected] All else is ok with the MacMini display out. The mDP to DisplayPort (DP) outputs 4K@30, but the same in MBP Early 2015 outputs 4K@60.